Tonbridge town centre will be full of excitement tomorrow when the town’s annual carnival takes to the streets. This year the carnival theme is “That’s Entertainment” so you can expect to see local interpretations of all varieties of entertainment from theatre, cinema, TV and maybe even local radio! In a break with an almost unbroken custom that has existed over twenty five years, this year's Tonbridge Carnival procession will not be assembling in Brook Street. Instead the carnival floats, classic cars, bands and other groups will gather in the Sovereign Way car parks, close to the Tonbridge Farmers' Market (which will also be up and running at Sovereign Way tomorrow) and then proceed from Avenue du Puy at 12.30 pm along the High Street passed Tonbridge Castle. With a variety of walking groups and motorised float entries, this year’s carnival promises to be bigger and better than ever and will also include the Southern England Marching Band Championship and Morris dancers. The Mayor of Tonbridge and Malling and Lion President will judge the entries later in the afternoon, on the Castle lawn, and will present shields to the best in each category taking part in the procession. 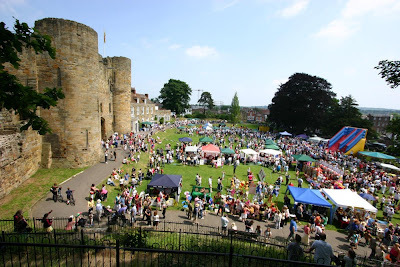 In addition to the fun of the carnival procession, there will be a Fête on the Castle Lawn and along Castle Walk providing an array of entertainment and fun activities throughout the afternoon including the silver band 2nd Wind who will perform at the Watergate entrance from 11.45am – 12.45 pm. As usual the show will feature Punch & Judy, Rondo the Clown, children's entertainment area, bungee trampolines, children's rides, a full arena programme presenting local talent, including the Cannon School of Irish Dancing, song and dance by Stagecoach and music from local band Rosewood Drift. And in the tradition of this popular event, there will also be a wide selection of tombolas, raffles and side-shows including the coconut shy, crazy kitchen and other games to test your skill as well as stalls selling cakes, jams, books, toys and jewellery. Hot and cold food, drinks, ice creams and scrumptious cream teas will also be on sale. The Carnival is organised annually by Tonbridge Lions Club with support from Tonbridge & Malling Borough Council. Proceeds from the day will help local good causes and Lions' charities.